When we decided to homeschool we had a good friend that was already successfully doing it for years. She sat down and asked us a few questions to determine if we had what it took to make it. I value that conversation because it made us really reflect on why we wanted to take our family on that adventure. 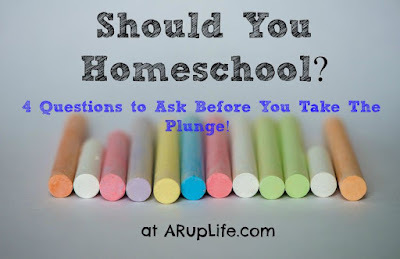 So are you thinking of homeschooling? I have a few questions for you! Why is the main motivation for homeschooling? For us it was simply that our local public school was not a good option. They had been in the news for some not so good reasons and we were not willing to send our children there. Private school or homeschooling were really the only options. Do you have the time to homeschool? It takes time. The planning and grading take up time. Then there is the actual teaching. My days are full. We can't really go out and do things or the work won't get done. Family sometimes doesn't get that - so we have to gently share that we have school work to do. The husband and wife have to have unity on the homeschooling front. If not things will get hard. On the bad days you need your spouse to support you. On the good days you want to have someone that shares the joy of your kids learning. While you will see all over the web that homeschooling can be done for free or next to nothing - that isn't always realistic. I truly believe having a solid curriculum for the main subjects helps us to be successful. We don't have to worry about missing chucks of learning because most curriculum spirals. I also have control over the subjects that we cover and their world view. 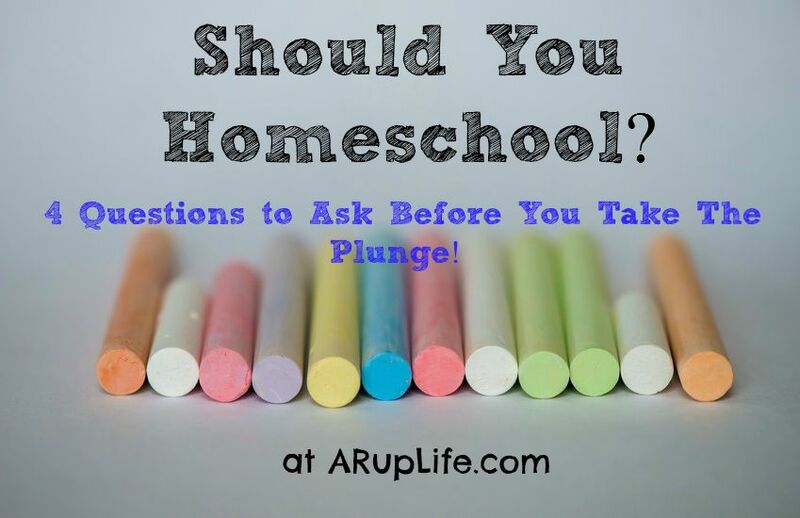 I hope these questions help you decide if homeschooling is the right choice for your family! If you have any questions feel free to leave a comment or email. I'm happy to talk 'homeschooling' with friends!